I have a new love in my life. They're called Navvy and hail from Sheffield which of course is the town responsible for tons of good bands over the last few years. 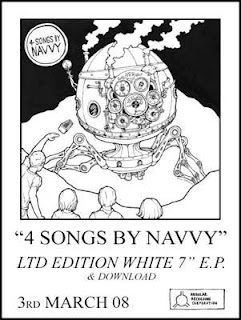 Navvy don't fit into that scene at all, they sound more like a collision between Disconcerts and The Fall and what a beautiful mess it is. This track comes from their debut release which is simply called "4 Songs" and I bet you can't guess how many tracks are on this 7" ep? According to their My Space page the band are going to be playing in York at the end of June so I'll definitely be catching them at that one. I think they sound like The Fire Engines which is no bad thing! A great band live.